Following investment gurus blindly may not be the best approach to investing, but using their words of wisdom to learn how to invest better is certainly a great idea, especially when those words come from Warren Buffett. As always, the Oracle of Omaha’s 2016 annual letter to his conglomerate Berkshire Hathaway Inc.’s (NYSE:BRK.A)(NYSE:BRK.B) shareholders carried some fine quotes, but one in particular could help turn bearish markets in your favour. Every decade or so, dark clouds will fill the economic skies, and they will briefly rain gold. When downpours of that sort occur, it’s imperative that we rush outdoors carrying washtubs, not teaspoons. And that we will do. If you’ve heard about Warren Buffett’s “be greedy when others are fearful” maxim, you know his reasoning behind those words. Let me be clear, I’m not calling for a market crash, but it’s always better to prepare oneself, especially in today’s highly uncertain global environment. As anything that goes up must inevitably come down, you shouldn’t have to lose sleep if the stock market reverses course. Instead, you should consider it an opportunity to scoop up boatload of shares of solid businesses that may have suddenly gone on sale, as Buffett plans to do. Let’s suppose you ignored the noises of an imminent crash in 2011, when the S&P/TSX lost almost 11% of its value, “brought out your washtubs,” and loaded up on shares of Canadian National Railway Company (TSX:CNR)(NYSE:CNI) or Toronto-Dominion Bank (TSX:TD)(NYSE:TD). Your investment would’ve more than doubled in value on a total-return basis (stock price appreciation + reinvested dividends). You’d have handily crushed the market during the period. 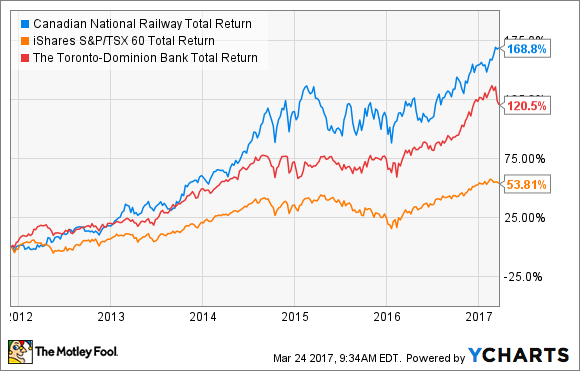 Both Canadian National and Toronto Dominion are among the best in class in their respective industries, have solid histories of earnings and cash flow growth, and have been strong dividend payers; this explains why they’ve made for such good bets when the markets tumbled. Of course, these two are just among many similar success stories that investors who didn’t fear the 2011 fall would’ve written by now. Every time the market drops, you should hunt for such solid stocks that you wouldn’t mind buying and holding forever and add them to your portfolio while they’re cheap. While economic down cycles could also hurt these businesses, they’ll still be strong enough to weather the storm in the long run and save your portfolio from nasty shocks. Fool contributor Neha Chamaria has no position in any stocks mentioned. David Gardner owns shares of Canadian National Railway. The Motley Fool owns shares of Berkshire Hathaway (B shares) and Canadian National Railway. Canadian National Railway is a recommendation of Stock Advisor Canada.